I know it's not "Father's Day", but sometimes we can get pretty cheesy on those types of days. I just wanted to write a post of appreciation to my hero. It's my Dad. He's always been there for me, and has always been the strong shoulder for me to lean on (and yes, to cry on as well). I remember when I got arrested in my teens, and I knew my Dad was just going to KILL me. I just knew it. But when he got there, and walked into my cell, he just said something that I'll never forget, "Robb, I want to tell you something… I love you very much." I wept so hard in that juvenile detention cell with my Dad. 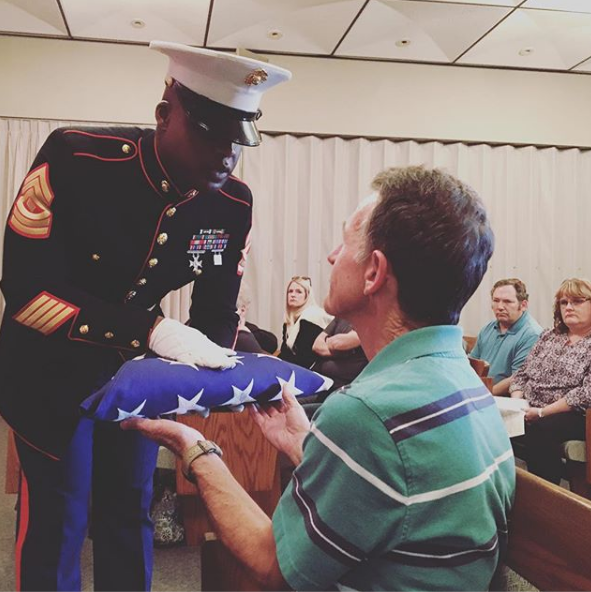 My Dad receiving a flag for my Uncle’s Ken’s service in the US Marines, at his funeral yesterday. (97 years old). If you have a Father today, give him a call, send an email, or go visit him. Being a Dad myself now, I realize just how important it is to have your kids love you with all their heart. This is so beautiful and sad. I'm sorry to hear of your uncle's passing. But your dad being there for you is so heartwarming. I do not have a good relationship with my father, but not my choice. My step-father, however, is my dad and I appreciate him very much. To me, he is my dad and has been there for me more than my father ever has.